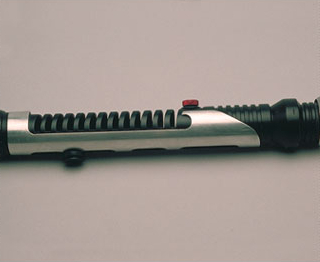 ﻿﻿ 光剑（lightsaber） - Databank - 星球大战中文网 Star Wars China - Powered by Discuz! The lightsaber is the weapon of a Jedi, an elegant armament of a more civilized time. In comparison, blasters are crude, inaccurate and loud affairs. To carry a lightsaber is an example of incredible skill and confidence, dexterity and attunement to the Force. In the hands of a Jedi, a lightsaber is almost unstoppable. It can be used to cut through blast doors or enemies alike. Using the Force, a Jedi can predict and deflect incoming blaster bolts, and reflect them back at the firer. After the extermination of the Jedi ranks, lightsabers became rare relics. The knowledge of their construction disappeared with their masters. Luke Skywalker, the last of the Jedi, built his own lightsaber as the culmination of his training. Although use of the lightsaber is strictly reserved to the Jedi -- the only ones capable of handling the difficult weapon -- it is also used by their sworn enemies, the Sith. Lightsabers have changed little in the thousands of years of their employ by the Jedi Knights. Those who believe the Jedi order began on the ancient world of Ossus point to the abundance of Adegan crystals in the system as proof. These crystals are ideal for the creation of lightsabers, as they focus the energy released from a saber's power cell into the tight, blade-like beam. Early lightsabers did not have self-contained power cells, and were instead connected by a conducting cable to a belt-worn power pack. Once unleashed, the power channels through a positively charged continuous energy lens at the center of the handle. The beam then arcs circumferentially back to a negatively charged high energy flux aperture. A superconductor transfers the power from the flux aperture to the power cell. As a result, a lightsaber only expends power when its blade cuts through something. So efficient is the blade, that it does not radiate heat unless it comes into contact with something. The blade's color depends on the nature of the jewel it springs from, and while its length is fixed in the case of a single-jewel lightsaber, lightsabers equipped with multiple crystals can have their length varied by rotating a knob that allows the focusing crystal activator to subtly modify the refraction pattern between the gems. 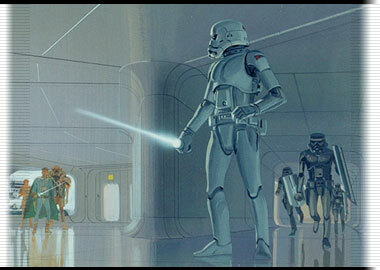 With the Sith long believed extinct, lightsaber dueling occurred only within the practice chambers of the Jedi Temple. To a Jedi, a lightsaber is not just a weapon. It is a means of concentrating attention and becoming attuned with the Force. 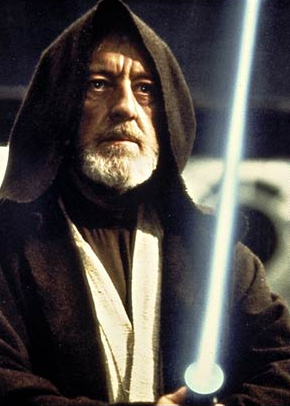 In the early incarnations of the Star Wars story, lightsabers were not weapons exclusive to the Jedi order. In fact, they were quite mundane, being used by Rebel and Imperial troopers alike. George Lucas then limited the weapon only to the Jedi Knights, to give the order a unique feel and an arcane quality. The technique for realizing a lightsaber onscreen has varied throughout the years. In the pre-digital days of the original trilogy, a variety of methods were use to create the lightsaber effect both practically (on-set) and optically (during post-production). One version had a motorized hilt that spun a blade covered in reflective material. The blade, when lit, did indeed glow in front of the camera, but it lacked the color and hazy corona that surrounded the pure white blade as seen in the finished film. These blades were cumbersome and fragile, and required a power source for the tiny motor. They did not make good sparring weapons, and the glow was colorless and inconsistent -- a tilt at the wrong angle would cause the blade to lose all its vibrancy from the camera's point of view. Most of the lightsaber luminosity seen in the classic trilogy was the result of rotoscoping. Years ago, rotoscoping described the process of laying tracing paper over a blow-up of a film frame, and tracing, frame by frame, the necessary animation. This animation was typically painted onto an animation cel - a transparent sheet of acetate. Those cels would then be photographed one frame at a time, and optically composited into the frame. The actors on set used simple rods that were colored in such a way as to make the job easier for the rotoscope artist. When a saber needed to be activated, one of two methods was used. A simple editing trick stopped the camera so that a prop man could replaced an unlit saber (which is just a handle) with a lit saber (one with a blade attached). When the film was played back, the saber blade would magically appear. The other method involved the actor using an unlit blade throughout, and the rotoscope artist would draw the growing blade. Since correctly drawing in the glowing blade without the benefit of a prop blade as reference is a challenging task, the scenes where a saber is first activated usually cuts away, to allow the replacement of the unlit prop with a full-bladed weapon. For The Phantom Menace, rotoscoping was again used to realize the lightsaber blade, but the technique has changed radically since the early 1980s. Now, rotoscoping is done digitally, and the blades are colored and animated with a computer, rather than ink and paint.